Ever just needed a cookie… like NOW. Don’t worry, I’ve been there too! Sometimes waiting until the weekend to bake up a batch of wholesome goodies just won’t do. Sure, the fudge pop you pulled out of the freezer may be a quick fix. But, let’s be honest…. there’s nothing like a batch of fresh baked Chocolate Peanut Butter Cookies right out of the oven! Just between you and me, I seem to have a sweet addiction to anything chocolate and peanut butter. I have tried to go cold turkey and rid the two out of my life (#worstdecisionever), only to find myself face planting into a 1/2 cup of powdered peanut butter with a heaping handful of mini chocolate chips. Yes, I am human and sometimes I too forget to heed my own advice. Trust me, lesson learned to practice what I preach and focus on balance and moderation after that stomach ache I’ll tell ya! In an effort to satisfy my chocolate peanut butter craving, I decided to see what I could create out of the #simpleswaps I had in my kitchen. 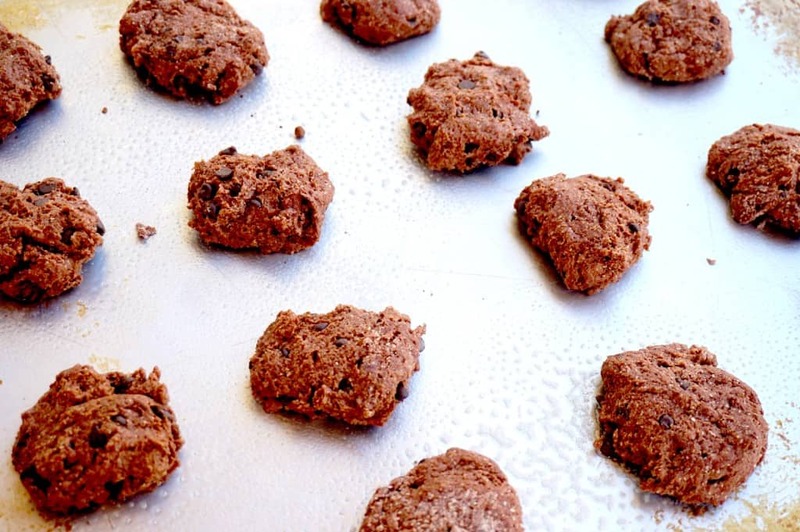 Luckily the chocolate chip raid from last week did not completely deplete my stockpile of the tiny goodies, so I was able to use those with a mix of cocoa powder, whole wheat flour and powdered peanut butter to create a decadently sweet, oh so chewy cookie on the fly. 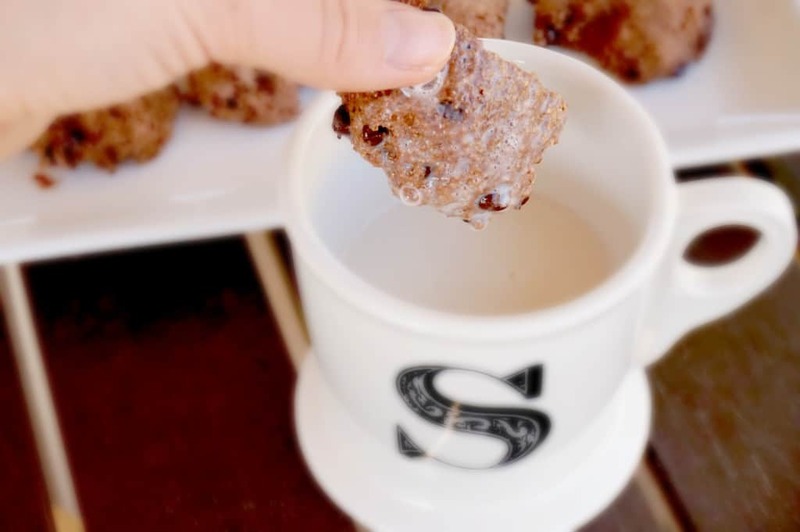 Now, not only are these bad boys made with ingredients I am certain we all can pronounce, but they’re also delicious as a snack… morning, noon or night. Take it up a notch and put a little powdered peanut butter and slice of banana between two cookies, sandwich together and you’ve got a protein packed, low calorie sweet treat. Trust me, you’re welcome! In a medium bowl, mix together almond milk, egg whites, stevia and powdered peanut butter. In a smaller bowl, mix all remaining ingredients together. Combine dry into wet ingredients until thoroughly combined. Drop by spoonful onto cookie sheet sprayed with cooking spray. Baked for 10-12 minutes until cookie are soft and moist (almost like a spring when you touch them!). Remove from oven, cool and enjoy! I strongly urge others to never give up chocolate or PB 😉 I also had a cookie craving the other night and had to make one. Loving this cookie! How can you go wrong with chocolate and peanut butter? These sound perfect! Chocolate and peanut butter is one of my favorite combinations, too! 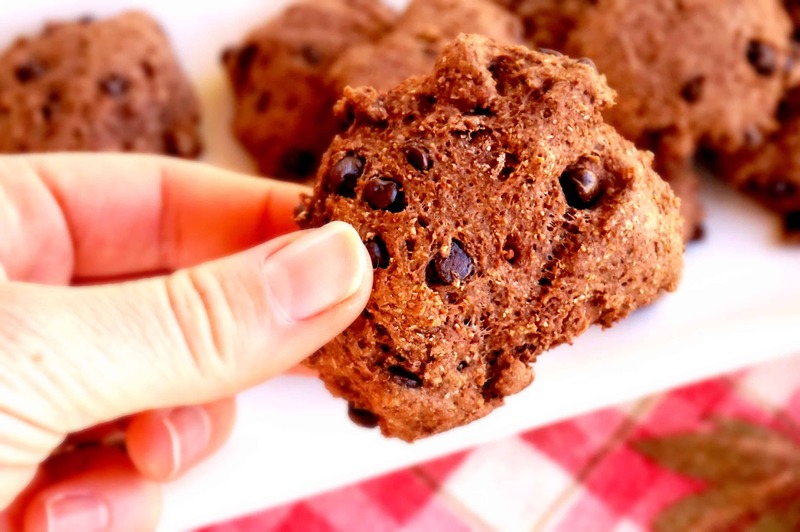 Love these cookies, will try them with a gluten-free flour swap. Yum! Which kind of GF flour do you usually use? Almond? Enjoy!! !